GOLD and SILVER prices held near 2-week highs against most major currencies on Thursday but platinum slipped back, trading down to $847 per ounce as European stock markets erased yesterday's rally to fall back towards 2-year lows. 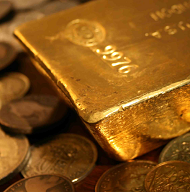 With gold prices at $1228 as US markets stayed shut for Thanksgiving, bullion in Euro terms held at €1076 per ounce. Eurozone banking stocks fell over 1.0% as German giant Deutsche Bank became implicated in Denmark's Danske Bank money-laundering scandal and Italy faced sanctions from the European Union over its 2019 deficit spending plans. The Canadian Dollar meantime rallied from 5-month lows on the currency markets as crude oil steadied above this week's new 13-month lows. 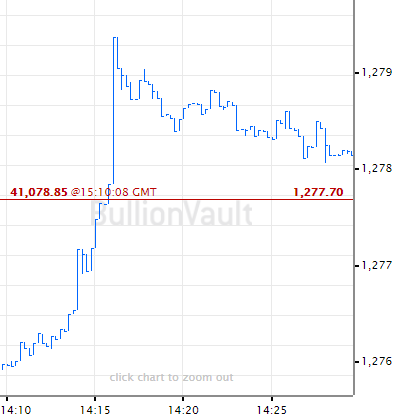 That pulled gold prices for miners in Canada – the No.5 producer nation – back to C$1624 from Wednesday's peak above C$1633 per ounce, the highest level since mid-July and . 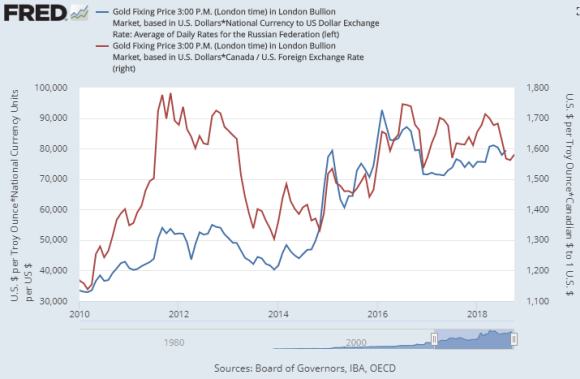 "With macroeconomic risk now being supplemented by concerns over systemic financial risk," says Canada-based brokerage BMO Capital Markets, "we expect portfolio allocation towards gold to edge higher towards year end." Wednesday night's rise in US Dollar gold prices came as hedge funds and other speculative traders closed their bets on gold prices ahead of the long Thanksgiving weekend reckons George Gero at RBC Wealth Management. "Shorts are covering," he told Kitco, pointing to the heavily bearish position currently held by Managed Money traders as a group overall. After No.2 gold mining nation Australia reported its highest output in 20 years, and with gold priced in Russian Rubles rising 142% so far this decade, No.3 gold producer-nation Russia mined over 231 tonnes in the first 9 months of 2018, new data said Wednesday, a rise of 1.7% from the same period last year. 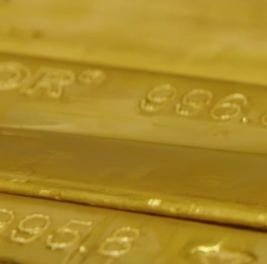 Over the same January-September period Russia's central bank bought gold equal to 85% of that output, accelerating Moscow's heavy accumulation of gold since US-EU sanctions first hit over the Kremlin's role in Ukraine's civil war, adding another 28 tonnes in October to reach new all-time record holdings of 2,075 tonnes. Putting Russia at No.5 among national gold holders, that's one-fifth smaller than France or Italy, two-thirds the size of Germany, and a quarter of the United States' reported reserves. The No.1 producer of palladium – the best-performing precious metal so far this decade, now up 3-fold in US Dollar terms since New Year 2010 – Russia this week signed an agreement with No.1 platinum miner South Africa to " promote the growth of the market of [those and other] platinum group metals through partnership and cooperation" according to the Tass news agency. "Palladium will remain in a substantial deficit this year and for the foreseeable future," reckons specialist consultancy Metals Focus, noting that "supply in 2018 is only looking at a rise of just over 10% since 2010 [because it] is mined in polymetallic ore bodies with the metal forming only a portion of total mine revenues." Platinum prices held flat on Thursday, trading unchanged for the week so far at $847 per ounce – down more than 43% so far this decade – as shares in would-be No.1 miner Sibanye-Stillwater (JSE: SGL) sank 5.6% after South Africa's competition regulator approved its takeover of ailing Lonmin (LON: LMI) on condition of a 6-month freeze in any job cuts. Silver meantime held steady with gold prices, showing a small gain for Thanksgiving Week at $14.51 per ounce. That's a drop of 14.3% from New Year 2010 for US investors. Gold prices have risen 11.9% over that time. A bounce in Sterling on Thursday's news of a Brexit "breakthrough" for UK Prime Minister Theresa May saw UK gold prices in Pounds per ounce erase the week's prior 0.8% rise, trading back down to £952. With EU national leaders set to review the UK's exit deal this weekend, the core elements of post-Brexit relations on trade, security and other issues have been "agreed in principle" Brussels said.